Things are not looking good in the North Pole. When we’re talking about a global warming of X degrees – let’s say 2 – it doesn’t mean that every place in the world will witness a 2 degree increase in average temperature. Climate change isn’t homogenous, and some places are much more drastically affected than others. Some parts will get much hotter, some parts will get a little hotter, and some places might even get a bit colder – that doesn’t mean that overall, climate change isn’t happening. Vulnerable areas will be hit harder, and the North Pole is one of the most vulnerable areas. While things have been looking pretty grim for a few years already, this time it’s much worse than usual. There’s a 20 degree Celsius (36 Fahrenheit) increase from historic averages, and that’s shocking by any standards. Even lower, in some parts of Russia, the differences were striking. 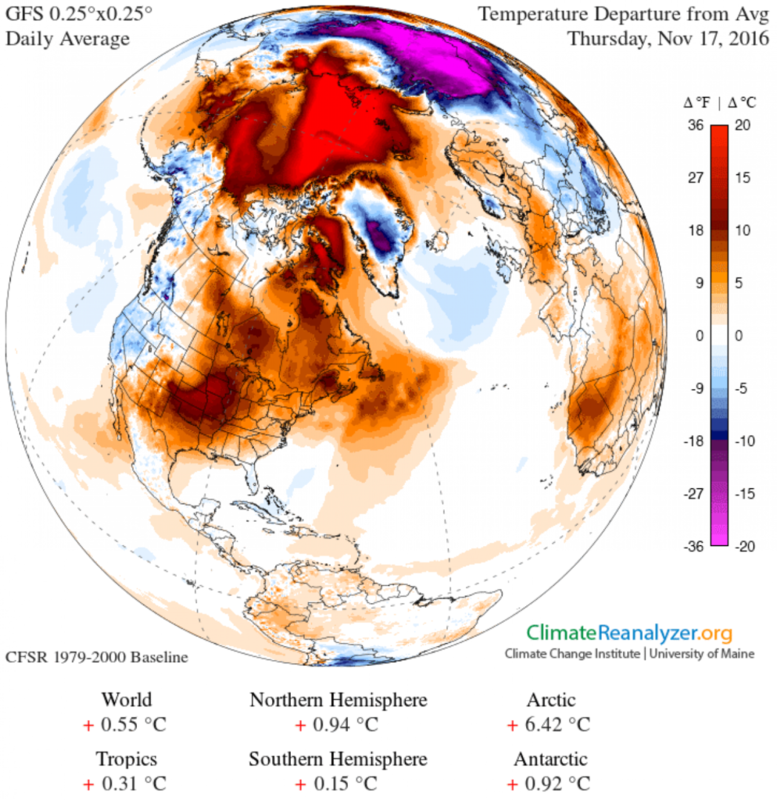 “In parts of Arctic Russia, temperatures were 10.8 to 12.6°F [6°C to 7°C] above the long-term average,” said Petteri Taalas, the Secretary-General of the World Meteorological Organisation (WMO). The Arctic is currently in its six-month polar night, when the sun hardly ever rises and temperatures go down fast. 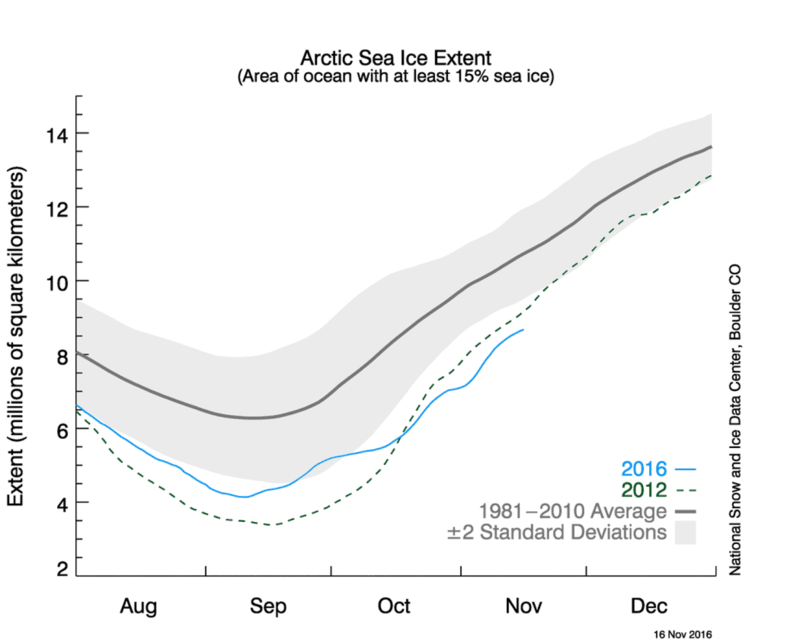 It’s the period when the thick ice sheets start forming but with these high temperatures, ice is reaching record-breaking lows, even compared to other stand-out low ice years like 2012. Arctic specialist at Rutgers University, Jennifer Francis, told The Washington Post that this change can be attributed to global warming, as 2016 is set to be the hottest year in history, surpassing (you’ve guessed it) 2015. “The Arctic warmth is the result of a combination of record-low sea-ice extent for this time of year, probably very thin ice, and plenty of warm/moist air from lower latitudes being driven northward by a very wavy jet stream,” Francis told The Washington Post. Researchers continue to monitor the temperature but it’s not clear at this point how these high temperatures will affect local wildlife and weather patterns.